The CPI(M) general secretary said that he and Mr Stalin "discussed in detail about an alliance to defeat the BJP in the 2019 elections". 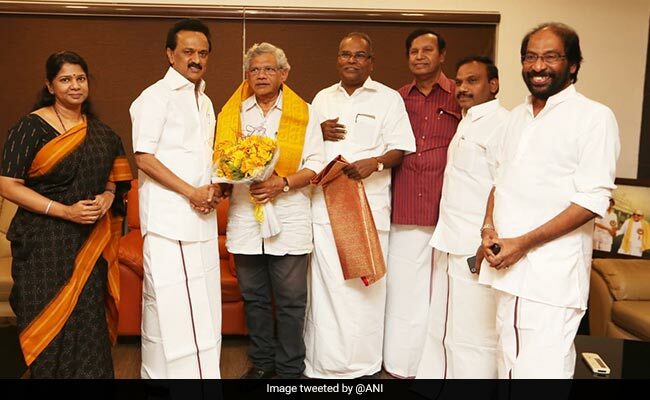 The efforts to bring together a broad alliance against the National Democratic Alliance gathered steam today with Communist Party of India (Marxist) general secretary Sitaram Yechury announcing that his party will support the DMK in Tamil Nadu. He made this statement after a meeting with DMK president MK Stalin in Chennai. "We have decided today that in Tamil Nadu, we will be with the DMK in the forthcoming elections. We are together on the issue of saving the unity, integrity and harmony of the people of India and the country's constitutional institutions," Mr Yechury said. On being asked if a national level grand alliance will emerge, he replied, "Political parties would be able to iron out their differences for this purpose. More than the attitude of the leaders, it is the people from the ground who will push the leaders to come together to save India. And it will happen". However, he said that the first step would be to forge state-level alliances. "Alliances in India have and will always take place primarily at the state level first. Then on that basis, a national alliance will emerge," he said, responding to a question on whether the CPI(M) would be open to an alliance with the Trinamool Congress and the Congress, who are its main opponents in West Bengal and Kerala respectively. "Things happen only after elections," he added, hinting at the possibility of a post-poll tie-up. The CPI(M) had aligned with the AIADMK in the 2011 assembly elections in Tamil Nadu and won 10 seats. The two parties were in negotiations for an alliance for the 2014 Lok Sabha elections but it didn't work out. AIADMK swept the state winning 37 out of Tamil Nadu's 39 seats. In the 2016 assembly polls, the CPI(M) formed an alliance with a number of smaller parties, but failed to win any seats.